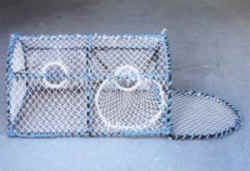 Creels are manufactured from 6mrn or 8mrn diameter bars. To stop them sinking in the muddy sea bed (the prawns' natural habitat), there are no base bars. Instead, they are covered all round with 33mm polyethylene (for easy cleaning) or nylon netting with 3" hard eyes. Parlours and bait bags can also be added to increase catching ability.